Surf Chalet is the beach destination for you and your group of up to 12 people. This majestic home sits directly across the street from the beach with access points within easy reach. Enjoy the Ocean Drive Difference by starting your vacation immediately upon arrival, as this property comes with fresh bed linens/bath towels, the beds are already made up for you, and the departure maid service are all included in your price. You'll have 3 levels for your family to spread out and enjoy tranquil privacy in the 4 bedrooms. The large master bedroom has 2 queen beds, a private bathroom and a private balcony with ocean views. The rest of the family will be comfortable in the king and twin beds, and there is a sleeper sofa for additional guests. The full kitchen allows for easy meal preparation, and the dining area is perfect for family meals and games. A downstairs den provides additional living space and makes a great kids' play area or gathering room. A giant wraparoud deck lets your whole group enjoy the beautiful South Carolina weather and serves as a wonderful sun deck for reading and working on your tan. The charcoal grill is provided to make it easy to cook up the catch of the day.There's even a fenced courtyard with outdoor shower for privacy outside. 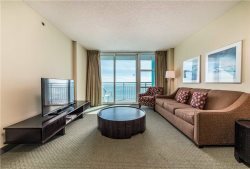 Rent Surf Chalet for your summer vacation, fall or spring getaway, family reunion, or golf trip and enjoy great Myrtle Beach attractions close by and the beach at your fingertips!